To keep its lead in the cross platform messaging arena, WhatsApp has done something that has been awaited by many users for quite some time now. 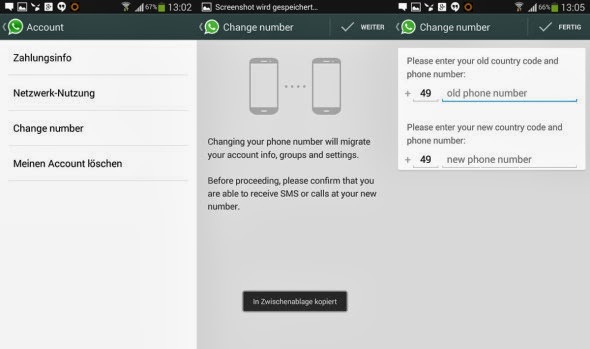 The latest update for WhatsApp gives you ability to change your phone numbers with the App. Earlier, when you lost your phone or moved out of town and got yourself a new number, you did have to register with the WhatsApp with the new number and would thereby have lost your contacts and archives, not any more. As per Caschy's Blog the new update will be available to users through Google Play soon but WhatsApp have posted the APK and you can download it right here. If you rather wait for the official App, it should be out by tomorrow. The new update really makes it simple to change your phone numbers. All you have to do to change the number is that you need to open the SETTINGS > ACCOUNT INFO. In the Account Info screen you will find the new option which is called “Change Number”. You have to feed in your old number and the new number. Once accepted by the WhatsApp server, this will migrate all your contacts, account information, and groups over to your new device/phone number. This update will surely make many people who turned away from WhatsApp to the likes of Line and WeChat return to the WhatsApp fold.